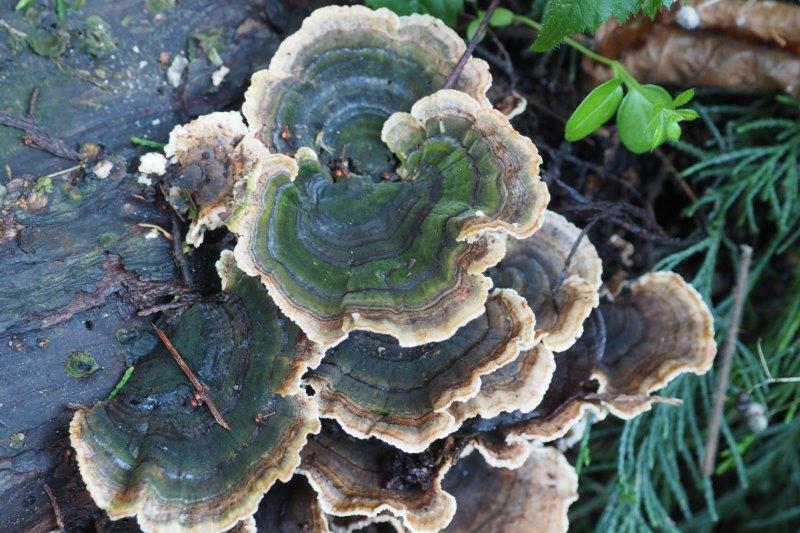 Whilst out & about today I came across a lovely collection of Turkey tail mushrooms growing on a dead log. 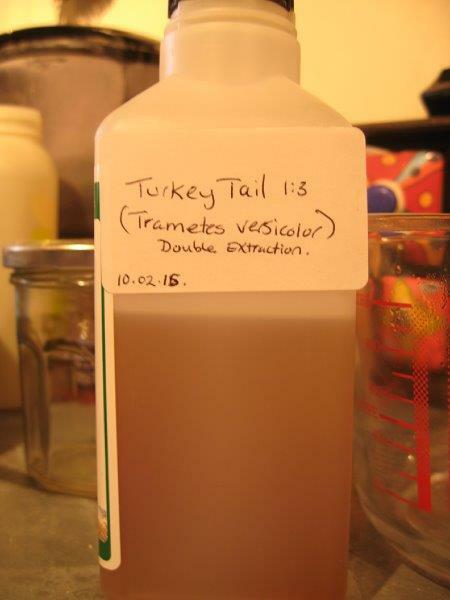 Turkey tail is a prolific native species. It grows on dead wood & sometimes on live trees. ( Caution; if you decide to pick your own mushrooms or indeed any plant, make sure you are 100% sure that you know what you are picking, get to recognise the plant/fungi first and cross reference it in a good guide book). It is widely used in Japan in conventional cancer care & Japanese research done on its complex polysaccharides, PSK & PSP, shows a notable effect upon the immune system and against certain cancers. It improves immune status in the presence of toxic stresses;as in chemotherapy. 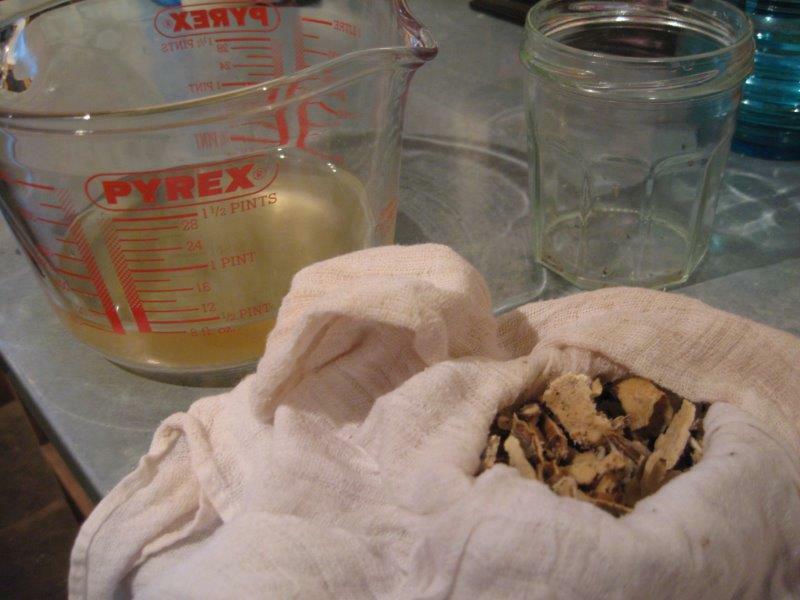 It has been shown to also have; liver-protective properties, be anti-viral & anti-microbial, useful in allergy management and to help regulate immune dysfunction in autoimmune disorders and being beneficial in chronic fatigue. 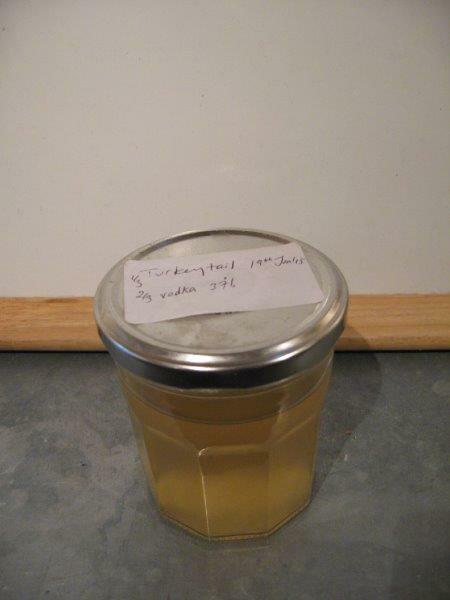 After attending a Medicinal Mushroom workshop run by herbalist Jesper Launder 2 years ago, I was inspired to make my own medicinal mushroom tincture last January from Turkey tail. 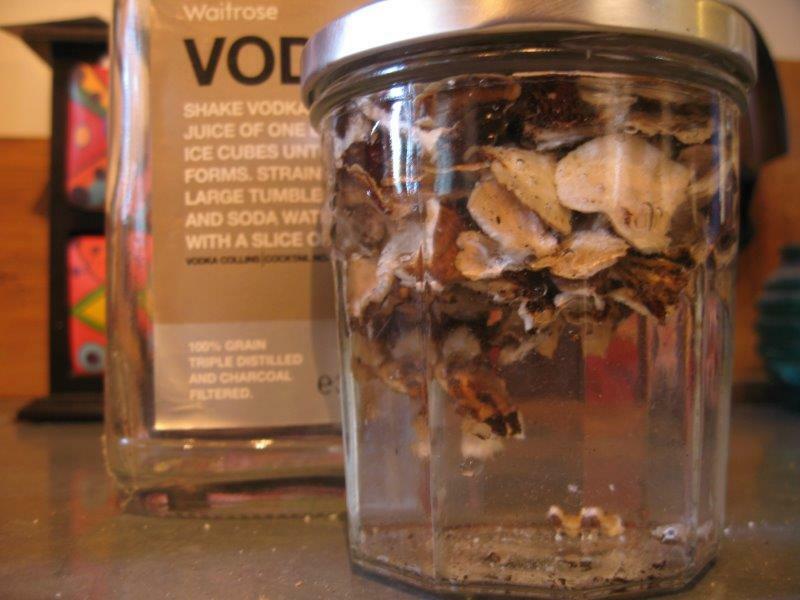 Its important to freeze turkey tail straight away before drying it out as Turkey tail is rather prone to wood-boring beetle eggs, otherwise they could hatch and ruin your dried mushroom store! 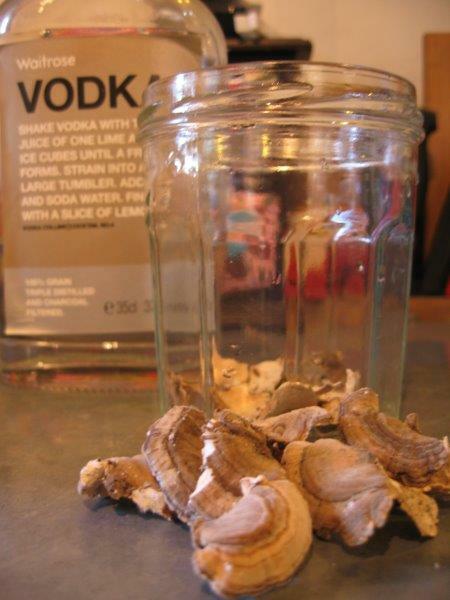 Below are some photo’s of the process of making a double extraction (to give you a broader- spectrum extraction by using both methods and mixing): Pic 1 – Turkey tail seen today Pic 2&3 – Add dried turkey tail to vodka using a 1:3 ratio (1 part mushroom/ 3 parts vodka). Seal & leave in a dark space for 2weeks. 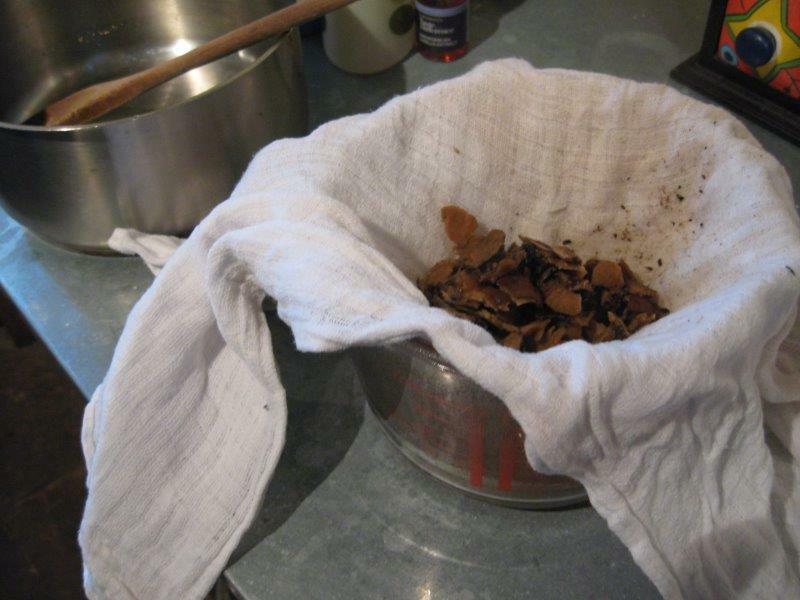 Pic 4&5 – Strain liquid through fine muslin/jelly bag and press. Store in airtight container & label. 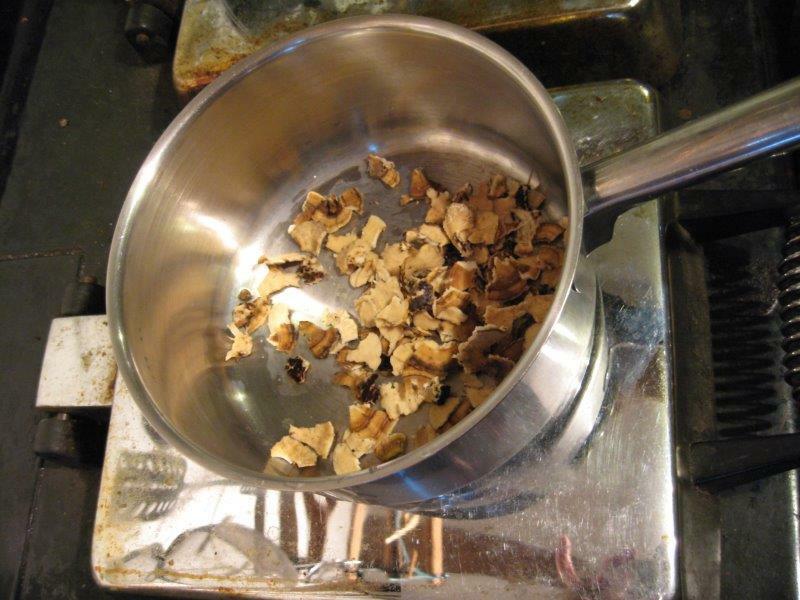 Pic 6 – Put the pressed mushrooms into a pan using 1:3 ration. Heat gently for 2 to 4 hours, reducing the volume of the liquid. 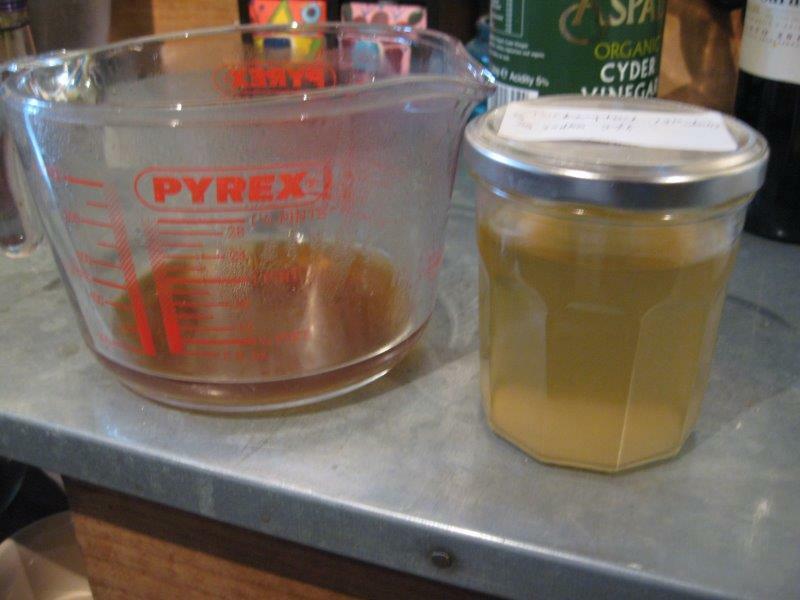 Pic 7, 8 & 9 – Strain as before and add the cooled liquid to the alcohol extraction, bottle and label.Dose for Adults; 5 to 10mls 3 x a day. 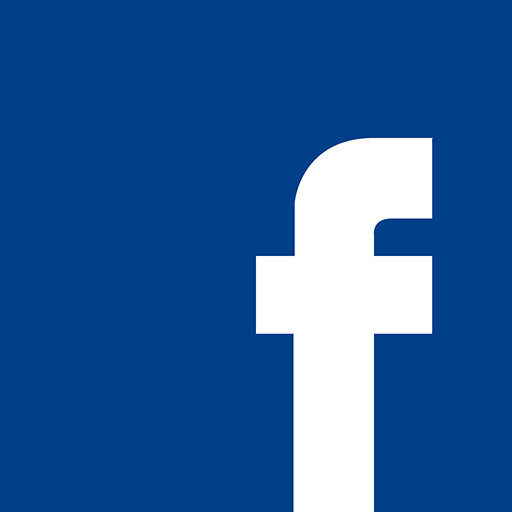 This entry was posted in Uncategorized on January 18, 2016 by Jessica Lucas.